In 1984, Mr. Guthrie founded Precision Classic Timpani. As a timpanist, he wanted timpani that would be portable and have a chain drive system that was smooth and efficient in design. The current chain system has been developed so that the timpani can be tuned at each lug station with a tuning key. As Mr. Guthrie has stated, “My main goal was to have a chain timpani that fine tunes the same way as my Dresden Timpani.” This mechanism has been produced along with a proven bowl design that gives the performer the ultimate in sound and reliability. Mark Guthrie is Principal Timpanist and Artist in Residence of the Kalamazoo Symphony Orchestra. Mr. Guthrie is also on the faculty of Kalamazoo College, adjunct Faculty for Western Michigan University and performs in the Kalamazoo Symphony Percussion Duo. He is known for his masterclasses and clinics around Michigan and the US. 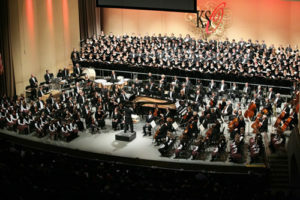 During the summers Mr. Guthrie performs as Principal Timpanist with the Bellingham Festival Orchestra. 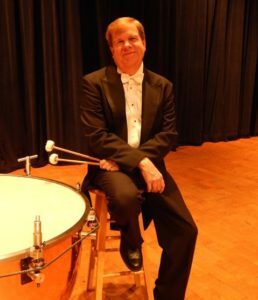 Mr. Guthrie has previously performed as timpanist with The Cleveland Orchestra, Toledo Symphony Orchestra, Grand Rapids Symphony, South Bend Symphony, I Musici de Montreal, Indiana Symphony, Toledo Opera Association Orchestra, Michigan Bach Festival and Bach Festival Orchestra.